Very interesting and very detailed article by Sean Cunningham for Real Clear Life.. 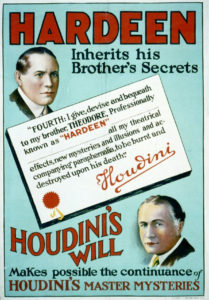 It doesn’t take a magician to conjure Harry Houdini’s place in films and TV series. Productions range from 1953’s Houdini with Tony Curtis (see below) to Houdini & Doyle, a 2016 project in which he teams up with Sherlock Holmes creator Sir Arthur Conan Doyle to solve particularly mysterious murders. He has been portrayed by an Oscar winner (Adrien Brody in 2014’s TV series Houdini) and a Reservoir Dog (Harvey Keitel in 1997’s FairyTale: A True Story—Doyle also appears in this one, played by Peter O’Toole).